A few words on a relatively new release from Staedtler. I don’t feel inspired to do a full review, but I do want to mention them. The item is the Staedtler 763 mechanical pencil. The 763 is available in 0.5mm and 0.7mm lead, and various colours. 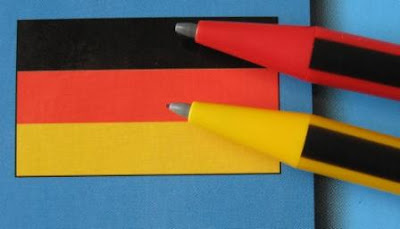 Capitalising on the strength of their brands, and linking in with their wooden pencils, one colour variant is Noris in the traditional yellow and black, and other is Tradition in red and black. The other colours are branded as ‘graphite’. Pictured here are the two I have – Noris 763 05 and Tradition 763 07, along with their wooden cousin Tradition 110 from Australia. They are quite good to look at, and I like the idea of linking to their wooden pencils. Why haven’t Staedtler thought of this before? The colours are quite matt compared to the gloss usually found on their wooden cousins. 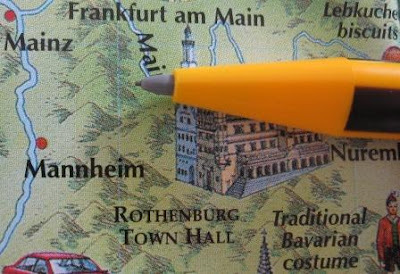 Some will see Staedtler colour schemes, some will see national colours, some their sporting colours – so many possible interpretations. The bodies are triangular in cross-section, continuing the ergonomic theme that is so popular these days. They are quite comfortable to hold. The tip retracts for pocket safety. 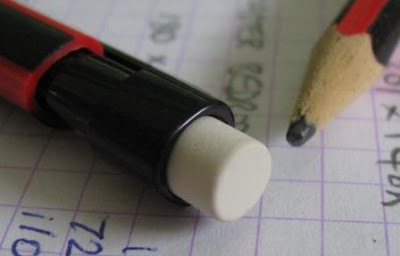 The eraser is described as “extra-large PVC and latex-free eraser”. Well, PVC and latex free I won’t argue with…but extra-large??? What a load of nonsense. If that’s their idea of extra-large I’d hate to see their small eraser. Spare leads are fed in after pulling the top section off. Anyway, these seem an interesting addition to the pencils priced towards the lower end of the spectrum. If I have money enought, I want to have it. Hello Ralrara. Yes, it is simple, but that's in keeping with their wooden pencils. It maybe of interest to you in particular that Lexikaliker pointed out to me that if you look hard you can see "KOREA" moulded into the pocket clip. Could you make any comments about "lead" stability? In pencils of this kind, there's often more "wobble" than one would want. What's your judgment for this one? David - There is some variation here. I have 2 x 0.5mm lead 763's and 1 x 0.7mm. The 0.7mm has very little lead wobble, but both the 0.5mm have more. Their lead stability is pretty good - there is some wobble, but I've certainly tested worse. Most of the wobble appears to be the retractable sleeve wobbling inside the tip of the body, rather than the lead itself wobbling inside the sleeve. Well one of them may have an Australian Theme but I bet it won't make it any easier to find in OZ. 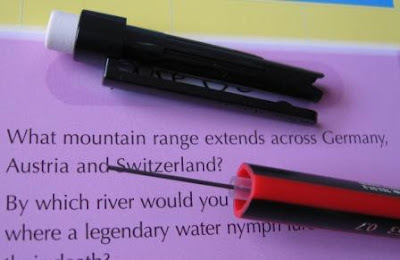 Yep sure enough I contacted Staedtler Australia and they said this model is not available in our market - TYPICAL. I suspect we're stuck with what we've got. It's the same with Faber Castell... If you want the good stuff, head to online and get charged inordinately expensive shipping fees. It's a real let-down. I agree Peter, but surely if ever a MP was going to succeed in the Australian Market the Tradition model would have been it. I must say personally however, I would have preferred the 763 Graphite which can be seen on the Staedtler International site. On the subject of Faber-Castell I've been having more success tracking down their product (models 1345,Grip Plus - which is a great sketching pencil) in a local Art Retailer in Newtown, suburban Sydney (Art on King). They also sell Caran d'Ache 2mm Fix pencils - a real surprise in this part of the world. 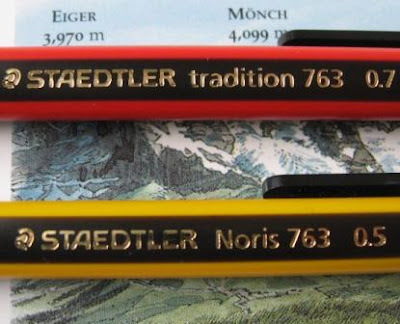 Yes, I'd have thought Staedtler Australia would take a chance and try the 763 Tradition to compliment their successful woodcase pencil. I just bought the Noris 0.7 version. Overall a nice item, soft black lead, lightweight good to hold. But the clip is awful! This one only stays in place with heavy fabric – so in fact I bought two, as I’m very likely to lose one out of my shirt pocket. Speaking of where to buy etc. . 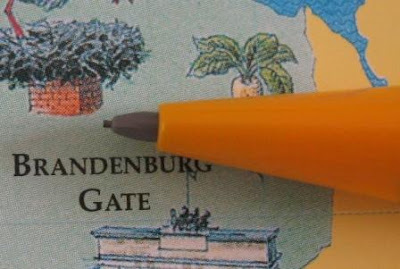 Here in the DK it seems that Staedtler has some agreement with the Post offices. Currently the post office is my “pencil pusher” – not the book & stationary shops or the art suppliers as one would expect. “Slide of trade” ? Love this pencil, I have they yellow Noris 763 0.5mm, exactly the same one from the picture at the top. it really has a firm grip of the lead so it rarely breaks or wobbles - even slightly. The triangular shape is great for grip as you said; better than the crappy soft plastic stuff on too many of the pencils today. The rubber is... Meh. Fine for a little mistake here and there but for big erasing jobs I'll stick to my Mars. Just bought a red one of these in Australia. Big W is stocking them ($2.50). I love this pencil. I have been on ebay looking for a box of them as they are fairly thin on the ground here in ireland. A student of mine was using one one day and I took it off him to show him something, I was tempted to pocket the pencil. Why is it great, the lead rarely breaks. i use it for writing, marking exams etc...but I use it because with any other pencil I have tried, I break the leads all of the time. This one almost never. Lead replacement is not so simple as described. Yes, it is easy enough to remove the clip and feed a new lead into the tube, BUT many times the new lead just simply will not appear at the other end no matter how many times you click the top or even shake it about. I have bought about 15 of these pencils over the past 2 years and only managed to refill 2 or 3 of them…….how can something so simple be so difficult in practice ? Could it be that my 0.5 replacement leads at 60mm long are too short to find their way down to the bottom of the tube even with some shaking about. These are the leads sold to me by Rymans at the same time as buying pens, Now looking around for longer leads on internet but they all seem to be 60mm long. Antone else having this issue please ? I just found a Mars Tri 773 in this Noris color. Bring back memories because Staedler Noris wooden 2B in yellow and black were everywhere when I was in primary schook in the 70s. I suppose my comment will be one of the last since Dave is closing this blog. Sad to see you go. I do wonder whether pencils, mech or otherwise will thrive in years coming. I do love them and recently have started to use them more even just to doodle around. The act makes me more aware of what goes on in the head... ha ha. These blog pages will remain our reference source for years to come I believe. I do hope someone will be good enough to start a new one to carry one Dave's legacy.